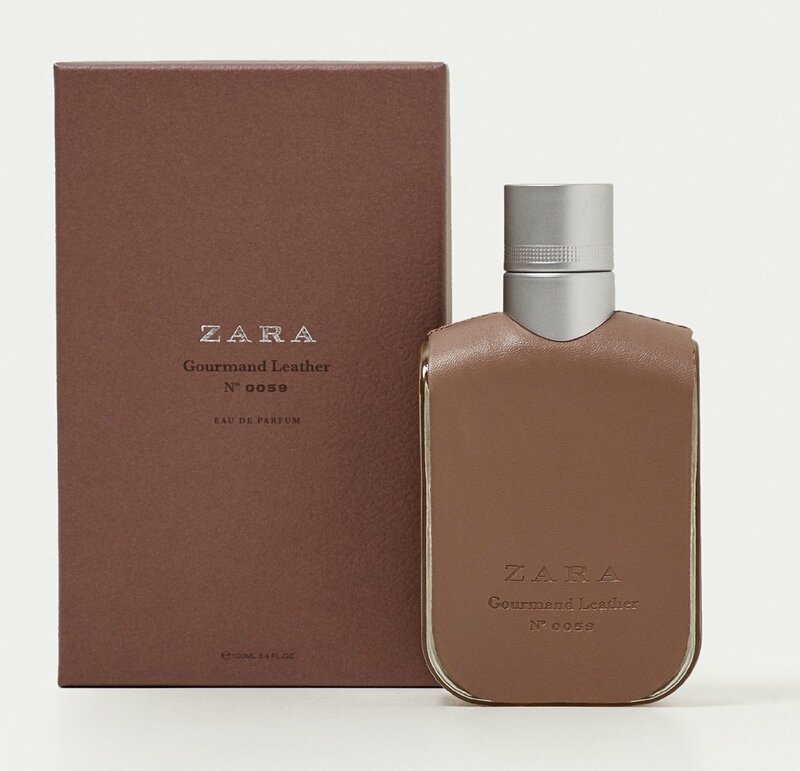 Gourmand Leather N° 0059 is a popular perfume by Zara for men and was released in 2017. The scent is sweet-gourmand. It is being marketed by De Ruy Perfumes. Gourmand Leather. Mhhh. Just the name makes me horny. I have once again followed my perfidious need to find even more Tripple-A fragrances with which I can dress olfactorily and feel good every day. This time I ordered this Zara scent blind. After he was described here in the community as "Ultra Male with citrus instead of pear", as "a bit leatherier and less sweet", and "at the end Tonka bean", I had the feeling that this can't go much wrong - I am a big Ultra Male lover. And the scent could be even better than his role model. Because I'm not sooo a big fan of the bulb, even if it works so well in Ultra Male that I love it anyway. Here, at any rate, it is less peary, which from my point of view reveals the true soul of this fragrance more beautifully. Not so distracted from the basic composition. It's also somehow more relaxed, the pear in Ultra Male makes it look a bit more like commerce / party / proll-smell, you know what I mean... about this cliché-associations you can stand above it or not, but Gourmand Leather makes it easier for me to like it, and to wear it with pleasure, and probably more often. Cynically, one could say that Zara copied a perfume and happened to make something better out of the idea of perfume DNA. Maybe more randomly than consciously. Almost paradoxical, but in the end I'm just happy to be able to enjoy this fragrance all the more. The fact that you can get the scent cheaper than Ultra Male, even though it is only available on the after-market, makes it even tastier ;) I got 150ml for an amazing 38€ (including shipping). You don't even get 40ml of Gaultier water around that, and you can really bathe in it, i.e. wet your body evenly to compensate for the possibly weaker performance. While I wrote the comment by the way, the fragrance is now more slowly set on my skin, and I find it direction drydown all the cooler and more pleasant. In the end, of course, you buy a mass product, so don't expect it to perform as well and consistently as the sailor next door. But from me there is an unrestricted blind buy recommendation! Tried this out at a Zara in northern Portugal. At first sniff, it was heavenly. Smelled like cream soda with a hint of ginger. Loved it. Bought one of the last remaining bottles on the shelf. Maybe a word in advance about the Zara Dupes themselves. As with La Rive, there are variations in quality, the extent to which fragrances come close to their role models, and of course the tiresome subject of durability. But Zara has a special problem here; many fragrances have a pungent, high-frequency scratchy and synthetic note in the drydown after a frequently acceptable top note, which delays the shelf life, but equalizes the fragrances in the early base note. But for me it's especially problematic that this, let's call it perfume glutamate, with its constantly booming presence in the background also causes headaches. With the newer scents like Pipeline and Teahupoo I don't notice them, but with 9.0 or this one here. But then Zara comes and reminds me of the 10€. The glutamate takes over the control and becomes stronger from hour 2-3. Gourmand Leather now says goodbye to the sailor, gets a bit leatherier, and slowly ends. I would describe the late base as light, close to the skin leather, no longer sweet, but now also freed from the stabbing drydown extender and thus quite compatible. After 8-10 hours it's over, at least on my skin. It lasts much longer on the test strip or on clothing. The brown rubberized bottle is now not really tingling, but the spray head doses properly and is easy to align. I don't expect more in this price range, although La Rive is mMn ahead of the pack here. I can't recommend Gourmand Leather quite as unscrupulously as Dry Oil (Dior Homme / Homme Intense), for example, or Just On Time (Pure XS), simply because the Zara Drydown pulls down the overall impression for me. But if you are looking for a long-lasting, clearly perceptible night scent, or if you like Ultra Mâle, you can take a blind look here. There I strolled on Saturday through the city center and tested of course also the one or other smell and among other things also the Armani Code Profumo. My statement was, that he almost convinced me, but somehow not and I found the base the best, but until then it took me too long. I didn't think it was bad, but it was very sweet. There were also plenty and here and there I sniffed at one or the other. One smelled like Dior Homme, the other again like shower gel and so on. Everything more or less quite nice, but nothing I needed now absolutely. For a fabulous 3,95€ I just took it with me. And *Plopp* I had somehow bought the Armani. Apparently this scent wanted to me whether I wanted it or not. Today I tested him extensively. The result is a very sweet, slightly powdery fragrance. Kirschig in my nose, without much course. In the background is something slightly citric, probably the lemon or bergamot. I don't really notice leather at all. I feel a bit too old, because he's already extremely sweet. Also reminds me of Polo Red Extreme. Maybe sugar is also a not listed ingredient, no nonsense, but although I like sweet scents yes, there are also limits. I think he is rather something for the younger generation, even if I don't say now that I won't even wear him from time to time. The price itself is of course top, so I don't have to be sorry. The durability is also very tidy. That's how it can go. You put one fragrance back on the shelf and it comes to you via detours. Though I'm not a fan of sweet perfumes, I love this one and Zara 9.0. They smell so good both! This one is really leathery. And sweet. And balsamic/camphory. Awesome smell! :D Very well blended giving the impression of a more expensive perfume. Nice presentation package, beautiful bottle. Huge longevity! I have in front of me a test blotter with GL and still smell it after more than 48 hours. On clothes I smell it after more than 30 hours. Unfortunately the sillage is not so awesome, but good enough. It projects fine/soft waves of aroma even after 4 hours. I bought it for ~10 euros and for this price it's great! My wife and I decided to go clubbing yesterday. Before going to the club and after a shower I thought "let me see what I am going to wear... blue jeans, a Chevignon white shirt and Ultra Male..."
Well... I remember then that my Ultra Male had finished two weeks ago. No issues... probably Ferragamo F Black will do... regular Le Male will do it as well... But what if I give a proof of fire to Gourmand Leather... Gourmand Leather it is!... that's decided. On the way to the club my wife commented "you know I like Ultra Male but tonight you over sprayed a bit; you are outshining my Sisley Eau du Soir". In the club I received 3 compliments more... "what are you wearing?" and I answered "Ultra Male off course". This morning my wife commented... "you still smell Ultra Male... I really like it". Now only you and me know that I really used Zara Gourmand Leather. It is a bit softer and less complex than Ultra Mail. By no means it will smell synthetic and cheap. Respray after 3.1/2 hours for more longevity and sillage. It's really a matter of personal choice. It is still 1/5 of Ultra Male price !!!! Congratulations. It is an excellent fragrance for itself. Comments: I wonder why some people are so obnoxious with inexpensive good colognes and keep on commenting "cheap, does not last, synthetic, smell of sewage" and so on. I do remember Steven from Redolessence commenting in one of his videos that he was out of regular A*Men and was using Cuba Prestige instead without the other people noticing it. Are Ultra Male and Gourmand Leather similar? Judging by the people around me, they are pretty similar. But are the 2 fragrances really equal? Well, I also can tell you that probably they are not equal. Zara's Gourmand Leather misses the opening Ultra Male pear opening note and stained my white shirt. I have never tested Ultra Male about white cotton textile staining. For the skeptics of using perfume clones I give another subject for you to comment on. Anyway, I already bought a 2nd bottle of Ultra Male. "His kiss tasted like the honey-bourbon he'd been sipping, and his skin smelled like sweet, delightful leather, and sensual man." "It has some similarities to Ultra Male by Jean Paul Gaultier." "Really nice opening and yes, it does smell similar to JPG Ultra Male." "This one is fantastic I have to agree, this is like Ultra Male." "It truly does smell very, very similar to JPG Ultra Male (I'd say the top notes are almost identical)." "This fragrance does absolutely remind me of JPG Ultra Male and it is also almost identical "
"Yes, this resembles Ultra Male by JPG, almost same smell..."
"This is 95% Ultra Male, as many have already said. " "It is very close to Ultra Male and I own both of those... "
"I have to agree, this is like Ultra Male, exactly like it. " Should I believe the hype? Let's look at the evidence. I sprayed Zara GL on one hand and JPG UM on the other and compared side by side. The flight takes off with a very agreeable citrus-mentholated accord, which lasts roughly half an hour. The opening is very similar despite the kind of citrus fruit listed is different. The scents continue with a fainting citrus note and an aromatic intense clary sage that adds a dark aspect to both. At this stage, in Zara GL a very pleasant and indulging iris note becomes dominant. The vibe is still alike, however, the powdery and buttery tone keeps the two apart for nearly one hour. The dry down reveals a very strong and lovable gourmand combo of tonka and leather that lasts a lot of time, 5 to 6 hours with 1 good spray on the back of my hand. Yet both dry down powdery, creamy, animal, musky, and dirty. Vanilla and tonka are dominant and rule the oriental facet of the base. Conclusively, in my humble opinion, Zara GL is a great uncanny clone of JPG UM, they are surprisingly similar at 99.999% with a powdery dominant note that distinguishes the former. Ideal for daily and nightly wearing, fabulous for office thanks to moderate yet inoffensive sillage but huge longevity. The best season is cold weather, from late muggy fall until early sparkling spring. Albeit somebody compares Zara GL to Armani Code Profumo, nor do I. To my nose they have nothing in common, at any stage of the development, two scents apart. I'm sorry, I just couldn't. The opening is a dreadful blast of sweet, synthetic crystallized weirdness with a tiny bit of iris in the background. Everything about this is just so sharp and biting. The drydown is a little better, but this is nowhere near natural or even smooth. Up close, I can't help but cringe my nose at that zingy, powdery nonsense; but after about an hour, the sillage can be rather pleasing. Just smell it from a distance! I never would have bought a bottle if my gf didn't ask me to. Personally I can tolerate it, but never enjoy it. I don't know why this recieved so much hype a while back. Leather? Dream on...this is a sharp sugar headache in a bottle. If you want decent Zara frags go with Ambre Noble, Tone Indeterminee or even RWA. At least those have some character, rather than the ADHD you're going to get with this juice. Try before you buy! Update: Oh it's Ultra Male alright. Nearly an exact copy. And after months of spraying, it's actually tolerable now - borderline enjoyable. I'm a little more impressed at how Zara managed such a good clone - one of their best - but I'm still not a big fan of it, nor JPG's original. It's just unfortunate that it's no longer availble, because compared to the vast majority of dross that the brand has come out with since... Gourmand Leather is a home run. Definitely recommended for girls aged 10-20!